The words “adaptive management” appear in almost every planning and policy document for the Sacramento-San Joaquin Delta. Indeed, under state law, habitat conservation plans such as the Bay-Delta Conservation Plan (BDCP) are obligated to include an adaptive management plan. But what does this really mean? So far, not much. Most “adaptive management” – in the Delta and elsewhere – hasn’t adapted or managed very effectively. Adaptive management has mostly been a hopeful, but largely unsubstantiated, promise to fix things later. Adaptive management became popular within the scientific community after the publication of a wonderful book by CS Hollings in 1978, Adaptive Environmental Assessment and Management. This book presents a systematic and practical approach for integrating scientific knowledge into environmental decision making and updating management policy as scientific understanding evolves. Computer models, field data, experts, and stakeholders are all involved. Management experiments are designed thoughtfully, using computer modeling to integrate knowledge about a complex system. These models are then updated with results from experimental management and other data, leading to cycles of improved understanding and management. In the 1990s, adaptive management gained institutional favor as a component of habitat conservation plans (HCPs), authorized under the federal Endangered Species Act. Many of these plans include adaptive management provisions, especially where scientific information about species and ecosystems is incomplete or where factors on the ground (such as economic encroachment into the species’ habitat) are in flux. California’s Natural Community Conservation Planning Act of 2003 authorizes natural community conservation plans (NCCPs), a state counterpart to federal HCPs, and requires NCCPs to include an adaptive management component as part of a species recovery plan. Over the years, adaptive management has also become a standard part of many other environmental mitigation efforts. Despite the popularity of adaptive management, numerous barriers impede effective implementation. One challenge is that management experiments often involve large changes that affect real stakeholders. If financial compensation is required to individuals or groups who stand to lose land or water resources from the experiments, the costs can be substantial. Another challenge is mustering the resources and political will to conduct the necessary scientific analysis. Often, programs are labeled “adaptive management” if they try something different, even if they lack the significant follow-up analysis required to improve scientific understanding and policy response. The much-heralded Vernalis Adaptive Management Program (VAMP), conducted over the past decade, illustrates both of these problems. VAMP paid farmers on San Joaquin tributaries to release pulses of water to speed young salmon on their way to sea. Because they profited from foregoing the use of this water, participating farmers developed an interest in having this become a long-lived experiment. Fish agencies collected data and avoided regulatory conflict. 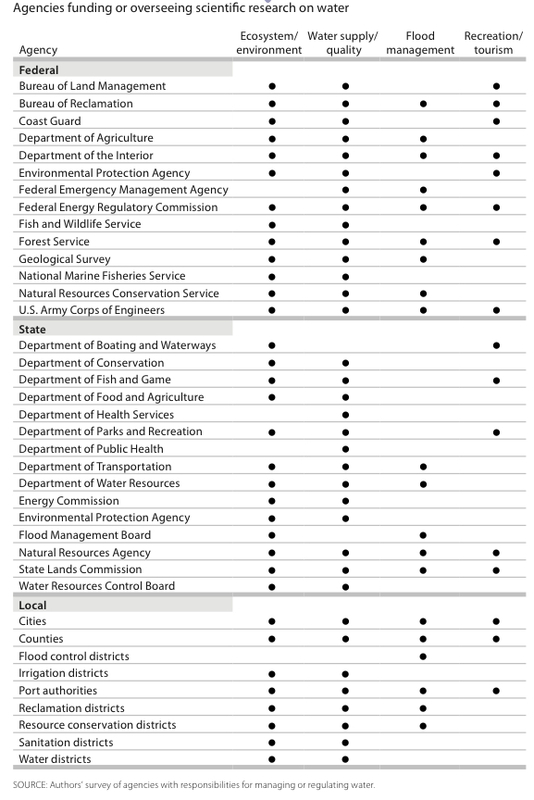 Water agencies benefitted by not having to make major changes in their own diversions. But in the end, the experiment appears to have been more successful for these various individuals and entities than for the salmon. Millions of dollars were spent, yet little synthetic modeling or experimental design was conducted to evaluate the effects on fish or to improve performance over time (Hankin et al., 2010). Another major obstacle to real adaptive management is institutional fragmentation. More than one hundred federal, state, and local agencies have management responsibilities within the Delta. Despite the efforts of the Delta Science Program and the Interagency Ecological Program to coordinate scientific and technical work, every federal and state agency, most large local and regional agencies, several non-governmental organizations, and many university researchers maintain their own science programs. The fragmentation of scientific effort has some advantages, notably in generating a diversity of perspectives and ensuring that each agency has some in-house scientific expertise. But on balance, this fragmentation has greatly hindered the coherence, thoroughness, and usefulness of dollars spent on science, thereby impeding the development of effective adaptive management approaches (e.g., National Research Council, 2010). Institutional fragmentation also makes it difficult to implement adaptive management experiments in a coherent way. Ideally, experiments should extend across jurisdictional boundaries (e.g. improving fish passage upstream or restoring wetland habitat elsewhere in the system). This will typically require coordination and cooperation across different project entities. Finally, fragmentation of regulatory authority is an obstacle, as agencies with different goals (and separate permitting authorities) typically will lack a common understanding of the problem. Can we do better? Despite its many problems, adaptive management remains the most promising approach to successful management of complex environmental systems. But to be effective, both management and science need to be coordinated, with serious efforts to learn from experimentation. Here is a suggestion for how this might be done in the Delta. A Delta Management Alliance (Delta AMA) should be formed to unite the adaptive management efforts of a wide range of entities with an interest in improving environmental performance in the Delta. The AMA’s activities would be coordinated and guided by the Delta Stewardship Council’s Delta Science Program (DSP). Indeed, integration of adaptive management activities for the Delta would become the DSP’s primary job. Other agencies would implement local and regional experiments, but the DSP would support these efforts and hold them to high quality standards. Such a structure would advance more effective adaptive management activities and provide a coherent scientific core for Delta issues, without preventing independent efforts by individual agencies and other entities. Integration and synthesis of scientific and technical knowledge. This would be the core mission of the Delta AMA. Such analysis is essential to adaptive management for complex systems, and it requires modeling (both conceptual and quantitative), data collection, testing, and documentation. Integration of hydrodynamic, water quality, and biological modeling also is needed to guide both science and management. Inclusivity and coordination. With the Delta Science Program at the helm, the Delta AMA would involve all state and federal agencies (US Bureau of Reclamation, US Fish and Wildlife Service, National Marine Fisheries Service, US Environmental Protection Agency, US Army Corps of Engineers, US Geological Survey, California Department of Water Resources, California Department of Fish and Game, California Department of Boating and Waterways, Delta Conservancy, State Water Resources Control Board, California Environmental Protection Agency, California Natural Resources Agency), as well as universities and major stakeholders that wish to participate (e.g., local agencies and non-governmental organizations). Agencies or groups could decline to join, or could leave at any time, but it should be recognized that independent adaptive management programs are unlikely to work and could interfere with each other. Although coordination does not guarantee integration, ideally the AMA would be strong enough to integrate the most important adaptive management actions. Pooling of resources. One key to integration is pooling resources. There are likely to be large untapped economies of scale in Delta adaptive management. By pooling resources, the Delta AMA could use adaptive management dollars more effectively. The AMA would need to garner enough financial resources from its members to induce agencies to integrate their adaptive management efforts. Voting on major decisions might be weighted by agency contributions. Diverse incentives for affected parties. The shared goals of the AMA should help to overcome some stakeholder resistance to adaptive experimentation. To keep down costs, regulatory relief should be explored as an alternative to financial compensation to those whose land or water resources are adversely affected by experimentation. Scientific leadership. The Delta AMA would appoint a Lead Scientist for a minimum of three years (or up to seven years to improve scientific constancy). Staffing through reassignment. Member agencies would assign individual technical and scientific staff to the common adaptive management organization, where they would be co-located. Professional staff could be released at any time by the Lead Scientist. We estimate that roughly 12-18 staff members would be needed to carry out the mission (see activities, below). Advisory role for technical experts. A diverse group of technical experts would participate in ad hoc advisory groups. The purpose of these groups would be to gain technical insights from experts who can see the big picture. Although some of these experts might be funded by stakeholder groups, this would not be a forum for agency and stakeholder representatives to air institutional positions. Rather, all participants would be asked to bring their professional expertise and independent judgment to the advisory group. Independent scientific review. An Independent Science Board would meet twice yearly to review the overall program at a high level. The DSP Independent Science Board could fulfill this role. Structured R&D program. Most funding would go toward this coherent scientific effort, where data and model development and field experiments are designed to inform each other in a systematic way. Most of this work would be done by other entities, but subject to external review. (2 AMA staff to oversee). Individual agency research programs. Considerable high-quality work is conducted within agencies, but it is not sufficiently distributed or integrated into the thinking of the broader community. By the same token, the direction of such research could often be improved by considering broader efforts and concerns. The AMA would provide a forum for coordination and sharing of this work, which would continue to be funded by individual agencies. (1 AMA staff to coordinate). Data collection program. The Interagency Ecological Program and others have made some progress in this area, but additional efforts to develop databases useful for the broader community would be helpful. The AMA roles would mostly be to set standards and coordinate efforts. (0.5 AMA staff to oversee). Knowledge integration and acquisition. A small AMA team would focus on technical knowledge synthesis, through modeling and data analysis, mostly in coordination with staff in other agencies and institutions. Developing a common data and modeling development effort across agencies is essential and would provide substantial economies of scale. Developing standards for open data, study efforts, and documentation also would go a long way to increasing the accessibility, utility, and quality of Delta science overall. (2.5 AMA staff: 1 for modeling, 1 for data management, and 0.5 for documentation). Knowledge synthesis. Panels of staff and external experts would produce policy-relevant reports and presentations on what the scientific and technical community has learned and expects to learn, drawing implications for policy and management decisions. Healey et al.’s The State of Bay-Delta Science is a good example. Regulatory coordination. Adaptive management experiments will face major state and federal regulatory challenges. The AMA would take the lead in coordinating these efforts. Regulatory agencies that are members of the AMA would commit to working toward more streamlined permitting and approvals. (2 AMA staff: 1 each from a federal and state agency). Stakeholder coordination. Stakeholders will have a keen interest in the adaptive management program, and it will be essential to keep them engaged constructively. (1 AMA staff to coordinate). Communications. Effective internal and external communications of the AMA’s and the broader community’s scientific efforts will be needed. (1 AMA staff). Everyone says they want better science. But in today’s Delta, science is often the battleground for competing stakeholder interests rather than the source of coherent information for policy decisions (Hanak et al., 2011). The objective of the Delta Adaptive Management Alliance is to create a solid middle ground where science and technical work are both sufficiently accountable to and isolated from political pressures to generate objective information that is useful to water administrators. The result would be a growing body of scientific consensus, which is better documented, more independent, more coherent, and harder to ignore and refute. Such a program is more likely than the current fragmented system to furnish the scientific information policymakers need to attain the co-equal goals of ecosystem sustainability and water supply reliability. The science for Delta decision making will never be perfect, but it can be much better. Hanak E., J. Lund, A. Dinar, B. Gray, R. Howitt, J. Mount, P. Moyle and B. Thompson (2011), Managing California’s Water: From Conflict to Reconciliation, San Francisco: Public Policy Institute of California. Hankin D., D. Dauble, J.J. Pizzimenti and P. Smith (2010), The Vernalis Adaptive Management Program (VAMP): Report of the 2010 Review Panel, Delta Science Program, May 13. Healey M.C., M.D. Dettinger and R.B. Norgaard, eds. (2008), The State of Bay-Delta Science, 2008. Sacramento, CA: CALFED Science Program. Hollings, C.S. (ed.) (1978), Adaptive Environmental Assessment and Management, London: John Wiley and Sons. Lund, J.R. (2011), The Delta, in 3-D, Californiawaterblog.com. National Research Council, Committee on Sustainable Water and Environmental Management in the California Bay-Delta, (2010), A Scientific Assessment of Alternatives for Reducing Water Management Effects on Threatened and Endangered Fishes in California’s Bay Delta, National Academies Press. This entry was posted in California Water, Sacramento-San Joaquin Delta and tagged adaptive management, California, Delta, habitat, multiple stressors, UC Davis Center for Watershed Sciences, water conservation, water management. Bookmark the permalink.